Have a weakness for alfredo, but not the fat? If I had to choose, pasta is my favorite food. When I first decided to try to eat mostly gluten-free I thought that would be the most difficult part. What I realized shortly after is that there are tons of alternatives out there to wheat pasta. Plus they are options that I actually really enjoy. I’m a huge fan of veggie noodles, rice pasta, quinoa pasta…. the list goes on! The next step was to see if I could find some pasta sauces that were relatively guilt free too. 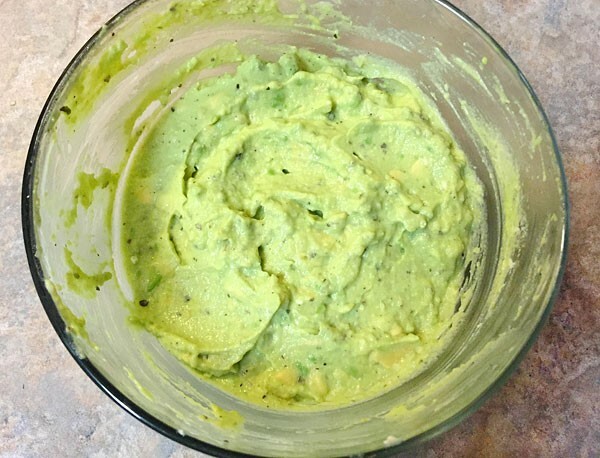 One of my main go-to sauces is an avocado sauce. I love avocado and if I have the choice to add it to a meal I will. I have been making this for years and it’s always satisfying! The best part about it is the healthy combination of greek yogurt to help thicken it up. This makes it creamy like an alfredo, but with good fats! 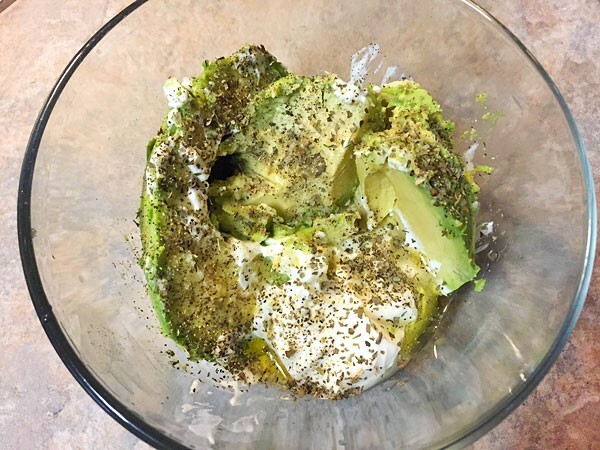 Put an avocado, lemon juice, a little bit of olive oil and some greek yogurt into a bowl. For the seasonings I usually use some sea salt, pepper, garlic and basil. Sometimes I like to throw in some red pepper flakes too. Mash up the avocado and stir until well blended. Heat it up slightly and continue to stir until the sauce reaches the desired consistency. Love #avocado? Love #alfredo? You can have both with this recipe! Aaaand that’s it- seriously! It’s one of the simplest sauces to put together and it tastes fantastic. The greek yogurt is high in protein and a much better substitution than using a heavy cream. This sauce is full of the right kind of healthy fats that are good for you. Just mix with your pasta of choice and enjoy! Want to update your cooking oil? This is a great way to satisfy your pasta craving! The rich and creamy consistency is similar to an Alfredo sauce but without the extra carbs. 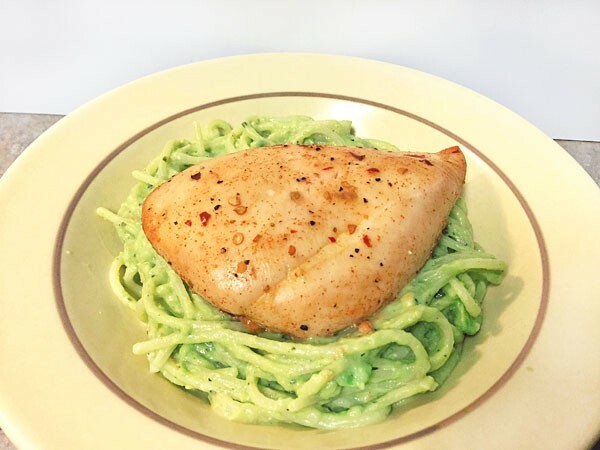 I used gluten free noodles and paired mine with some baked chicken. 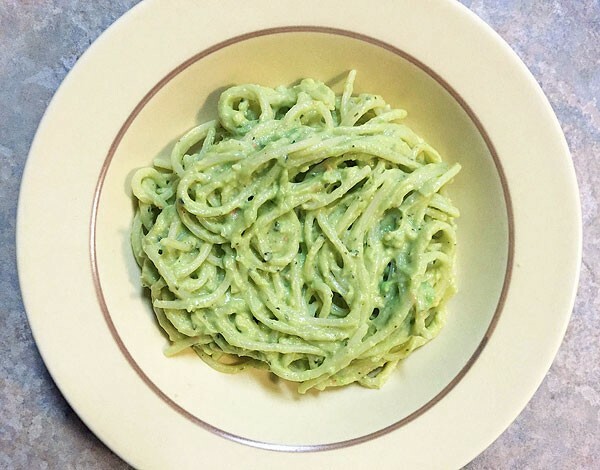 Pasta with greek yogurt avocado sauce. 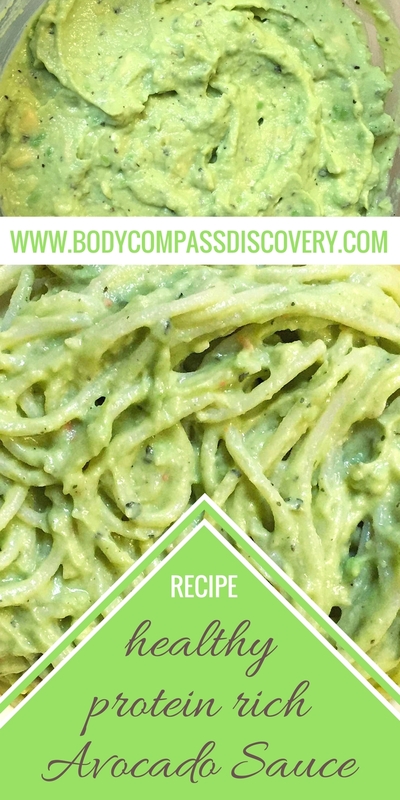 While you cook your pasta of choice you can prepare the avocado sauce. Start by cutting the avocado in half, removing the seed and scooping the rest into a bowl. Discard the peel. Add in lemon juice, olive oil, garlic and the greek yogurt. Sprinkle with the rest of the seasonings. Mash up the avocado with a fork as best as possible, then stir everything together. Heat the contents of the bowl slightly in the microwave and then stir again. Continue to reheat and stir as needed until well blended. Combine with noodles and enjoy! 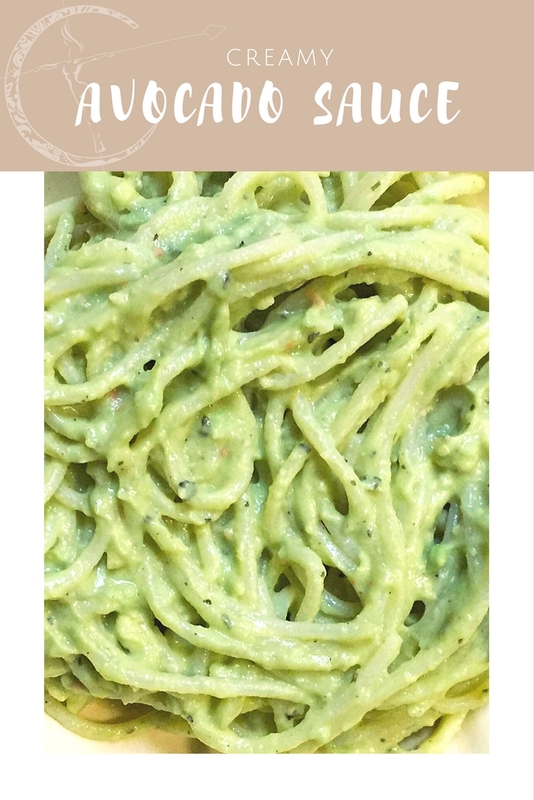 If you want another version of an avocado sauce with a little more to it I highly recommend this magic green sauce from Pinch of Yum! 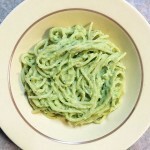 This avocado sauce recipe is gluten free, and a delicious green alternative to a fattening sauce drenching your pasta. When making this as part of a meal prep it counts for 2 servings. Each of those servings consists of 1/2 a red container, 1 blue container and 2 tsp. The pasta would be counted separate as a yellow container.